Here's the question we wanted answered: "Can we find a do-it-yourself ETF portfolio recipe that beats some of the leading asset managers?". So we graphed the risk vs. return profile (over the past 10 years) for five leading asset managers. The five chosen managers/firms are Ivy Asset Management (Ben Inker), GMO, Leuthold, UBS, and BlackRock. We used an Asset Allocation Fund from each manager to represent their performance. We found 46 Portfolio Recipes that beat all the managers by generating higher return with less risk. Buying an asset allocation mutual fund is one way to counter the market's volatility. By purchasing a single fund, you get a diversified portfolio that avoids putting everything in one basket. This approach sounds like a plausible plan for tapping the expertise of fund managers to diversify your portfolio. But the statistics show that many of these fund managers are the "late to trends" kind of people in the Jim Cramer quote above. Over the past 10 years, 81% of Global Funds underperformed their corresponding benchmark, the S&P 1200 Global Index (source: SPIVA Mid-Year 2016 Scorecard). In other words, in most cases, you would have been better off buying index funds instead of an actively managed fund. Although this 81% statistic relates to equity-only funds, our suspicion is that asset allocation funds underperform, too. So what's an investor to do? What's a better way to create a diversified portfolio instead of using a mediocre asset manager? In this article, we identify dozens of do-it-yourself ETF Portfolio Recipes that beat the famous asset managers. Each fund is managed by a notable portfolio manager or company. Each fund uses global asset allocation across multiple asset classes (e.g., stocks, bonds, cash). Each fund has been operating for more than ten years. Each fund is actively managed and re-allocates based on market conditions to minimize risk and maximize return. Our goal is to find Portfolio Recipes with both a higher return and lower risk than all five of the reference portfolios over the past 10 years. Looking back ten years allows us to capture the last major market downturn in 2007-2008. For the return metric, we'll use total annual return including dividends and distributions. For the risk metric, we'll use maximum drawdown, which is the largest peak-to-trough drop in a portfolio's value. Exhibit A (below) gives us a quick idea how these funds have performed over the past ten years. Ivy Asset Strategy outperforms all other funds in terms of both risk and return. BlackRock Global, which has $40 billion in assets under management, has performed about the same as the Ivy fund. Since we track the ingredients and performance for over 200 "portfolio recipes" (our name for asset allocation models) at RecipeInvesting.com, we can pit these five funds against a broader set of Portfolio Recipes. So let's create a scatterplot showing the total return vs. risk for the five managers plus all the other Portfolio Recipes we track at recipeinvesting.com. Exhibit B (below) shows the results for the 10 years (120 months) ending November 30, 2016. This gives us a visual comparison and allows us to find the winners and losers more quickly. The best portfolios will be nearest to the top left corner of the chart, which represents the ideal combination of high return and low risk. After this filtering exercise, we found 46 portfolios at recipeinvesting.com that beat all five of the global asset managers. These are shown in the light green area in Exhibit B (above). By "beat" we mean that these 46 Portfolio Recipes had both a higher return and lower risk than all five reference portfolios. The best reference portfolio generated 5.1% return with 29.2% maximum drawdown. So all the Portfolio Recipes in the green shaded region have a better return with less risk than all five reference portfolios. The blue squares represent tactical Portfolio Recipes that beat the five funds. The purple squares represent strategic (static) ETF Portfolio Recipes that beat the five funds. 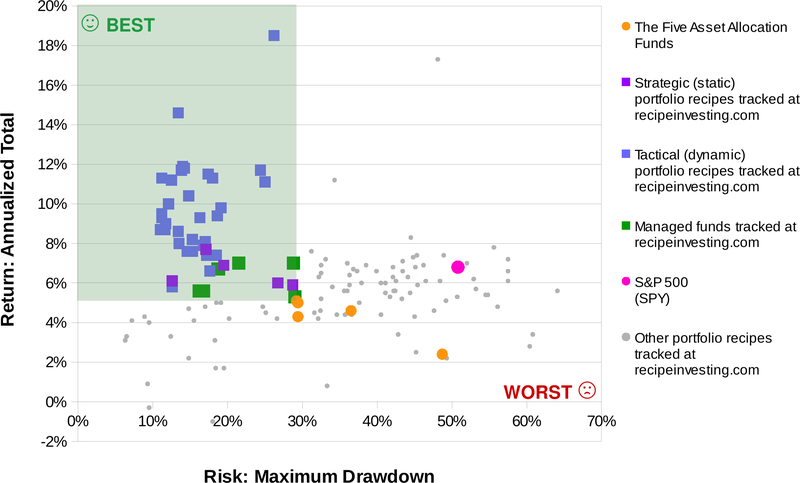 The green squares represent other managed Portfolio Recipes that beat the five funds. The small gray dots represent all the other Portfolio Recipes tracked at recipeinvesting.com. These did not beat all five of the reference portfolios on both risk and return. However, several of these portfolios (gray dots) did beat the reference portfolios (orange dots) if you only consider risk or return, but not both. As a benchmark comparison, U.S. Equities (NYSEARCA:SPY), shown as the pink dot, returned 6.8% with a maximum drawdown of 50.8% during the same period. So while SPY had a better return than the five funds, it had a much worse drawdown. Other active managers: These are mutual funds that have a better risk vs. return profile than all five of the reference portfolios. 7 of the 46 portfolios fall into this category. Tactical Portfolio Recipes: These are ETF model portfolios that are updated monthly based on an underlying algorithm or asset allocation methodology. 34 of the 46 portfolios fall into this category. Strategic Portfolio Recipes: These are static ETF model portfolios with ingredients that do not change month-to-month. These recipes hold a fixed set of ETFs which do not change, but the holdings are rebalanced monthly to match the original asset allocation specified by the Portfolio Recipe. 5 of the 46 portfolios fall into this category. Now let's take a closer look at the Top 3 Portfolio Recipes in each of the above categories (Managed, Tactical, Strategic). We'll rank based on drawdown (lowest drawdown is best). We provide detailed risk and return metrics for each of these portfolios at RecipeInvesting.com. Managed Portfolio #1: Fidelity Strategic Income (MUTF:FSICX) is a multi-strategy income portfolio. This fund returned 5.6% annually over the past 10 years with a maximum drawdown of 16.2%. Managed Portfolio #2: Hundredfold Select (MUTF:SFHYX) uses multiple actively managed diversified and uncorrelated trading strategies in bond and equity markets. This fund returned 5.6% annually over the past 10 years with a maximum drawdown of 16.8%. Managed Portfolio #3: Vanguard Wellesley Admiral (MUTF:VWIAX) follows an investment style of asset allocation with 30% to 50% in equities, mostly in the U.S. market. This fund returned 7.0% annually over the past 10 years with a maximum drawdown of 28.8%. Tactical Portfolio #1: Minimum CvaR Portfolio (t.cvar) uses a conditional value-at-risk (CVaR) approach for portfolio optimization. The December 2016 ETF ingredients for this recipe are the iShares MSCI EAFE ETF (EFA) (20% allocation), SPDR Gold Trust ETF (GLD) (19%), iShares Russell 2000 ETF (IWM) (9%), and SPY (52%). This recipe returned 8.7% annually over the past 10 years with a maximum drawdown of 11.0%. Tactical Portfolio #2: Minimum Mean Absolute Deviation Portfolio (t.madm) uses a risk-driven portfolio optimization technique. The December 2016 ETF ingredients for this recipe are GLD (29% allocation), SPY (56%), and the iShares 20+ Year Treasury Bond ETF (TLT) (15%). This recipe returned 9.5% annually over the past 10 years with a maximum drawdown of 11.2%. Tactical Portfolio #3: Minimum Downside MAD Portfolio (t.madd) approach is similar to the "t.madm" recipe, but accounts for minimum variance. The December 2016 ETF ingredients for this recipes are similar to t.madm. This recipe returned 9.4% annually over the past 10 years with a maximum drawdown of 11.2%. Strategic Portfolio #1: Harry Browne-inspired Portfolio Recipe (s.brow) allocates equally to stocks (like the Vanguard Total Stock Market ETF (VTI)), long-term U.S. Treasurys (like the iShares 20+ Year Treasury Bond ETF (TLT)), cash (like the iShares 1-3 Year Treasury Bond ETF (SHY)), and gold (NYSEARCA:GLD). This recipe returned 6.1% annually over the past 10 years with a maximum drawdown of 12.6%. Strategic Portfolio #2: Permanent Plus Portfolio (s.plus) starts with Harry Browne's 4-part portfolio, but then removes the cash component to increase the portfolio's total return (with some increased risk). This recipe returned 7.7% annually over the past 10 years with a maximum drawdown of 17.1%. Strategic Portfolio #3: No Equity Portfolio (s.noeq) holds no stocks and consists of just three ETFs (TLT, GLD, and the Vanguard REIT Index ETF (VNQ)). This recipe returned 6.9% annually over the past 10 years with a maximum drawdown of 19.5%. Professionally-managed, asset allocation mutual funds haven't kept pace with several other approaches over the past 10 years. We found 46 Portfolio Recipes which outperformed several well-known asset allocation funds in term of both total return and risk. Investors should consider ETF Portfolio Recipes like the ones uncovered in this article. Investors can employ a do-it-yourself approach or partner with an advisor who knows how to choose and implements asset allocation recipes that produce results.